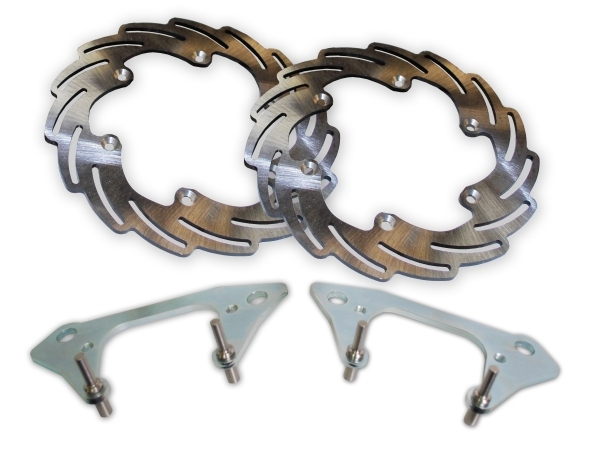 Streamline Brakes has now officially released our RZR 1000 front and rear over size brake kits. We have had several Pro teams racing in Lucas Oil Off Road , WORCS, SCORE and Best In The Desert series complaining on how the stock brakes are just not adequate for the RZR 1000 and how they are having stock brakes over heat and fail. To the everyday rider or weekend warrior when adding oversize tires, larger wheels full cage with doors and all the other added bolts on that we all are doing it does add weight and rolling mass to the SXS. What that is doing is making the stock brakes work at a capacity of more than what they originally designed for. What we have done was made a larger front rotor kit for the RZR 1000 and not only does it restore the brakes to what the stock brakes can do but when adding the rear oversize kit with the front kit in can increase the braking ability by up to 30% over the stock RZR 1000 brakes.